EU chief Juncker confirmed that the EU 27 stands in solidarity with Ireland, and there can't be no compromise no changing of the Brexit deal. He added that the British PM Theresa May, who he will be meeting on Thursday, knows the EU is not willing to renegotiate the Withdrawal Agreement. "Brexit is not a bilateral question between the Republic of Ireland and the UK… It's a European issue and that's why we cannot accept the idea that the withdrawal agreement could be reopened. The backstop is part of the withdrawal agreement and we cannot reopen the discussion on the backstop. She knows that the Commission is not prepared to reopen the issue," Juncker said. 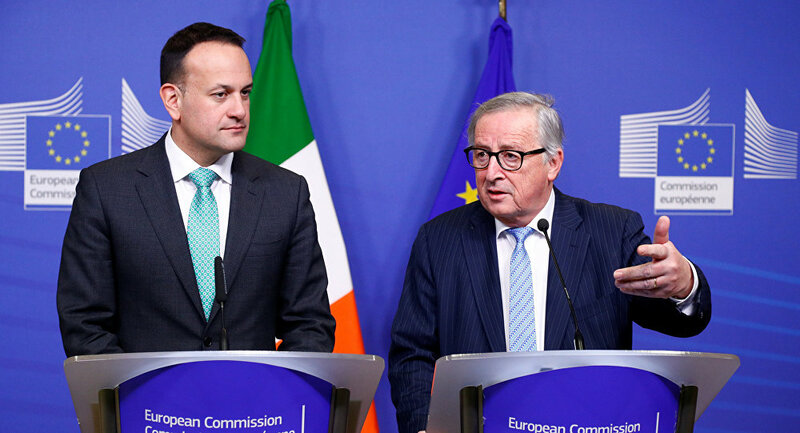 The Taoiseach Leo Varadkar, holding a number of meetings with European leaders on Brexit, announced that Mrs. May will meet with him on Friday, 8 February. "I am confident a solution can be found. Ireland is increasingly prepared for a no-deal," Mr. Varadkar added. Juncker and Varadkar discussed EU support for Irish fishermen, farmers and other enterprises that would be affected by Brexit. Varadkar spoke about the "… means by which we can provide aid to farmers and fishermen, intervene in businesses that are adversely affected — either to rescue and restructure them or provide capital loans and reorientate their business away from trade with Britain towards trade with the rest of the world. "I'm less Catholic than my good friend Donald. He strongly believes in heaven and by opposite in hell. I believe in heaven and not in hell, apart from what I'm doing now, which is hell." EU Council President Donald Tusk and Irish Prime Minister Leo Varadkar give statements after a meeting at the European Council headquarters in Brussels, Belgium February 6, 2019. British MPs passed an amendment on 29 January, seeking the Northern Ireland backstop to be replaced with "alternative arrangements." Commenting on the motion, Mr. Juncker said on Wednesday that "alternative arrangements can never replace the backstop." "There is no way to have a unilateral jumping out of the backstop because it's needed as a safety net," Juncker argued. Another question during the press conference addressed a remark by the German Chancellor Angela Merkel who recently said the EU should be open to creative suggestions on the backstop. Varadkar responded, saying her "can't interpret" Merkel's comments but noted that "all politicians are creative" and that "we have already been creative with the Withdrawal Agreement." He concluded that it is now time to be creative "for those who have created this problem," adding he is looking forward to meeting Theresa May on Friday night.